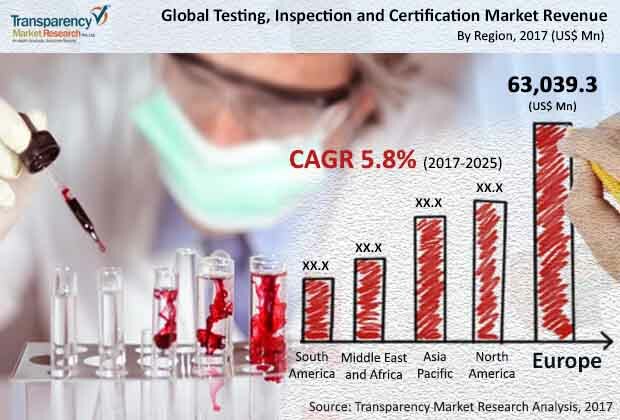 The global testing, inspection and certification market is experiencing growth owing to the factors such as increased outsourcing of testing, inspection & certification services and diversified requirement of products and standard regulations. Regulations pertaining to quality, health and environment safety have become stringent in the recent past which is driving the demand for these services. Apart from this, end-user demand seeking third party assurance and improved risk awareness and focus on risk prevention are also the major factor which are expected to boost the demand for testing, inspection and certification services across the globe. The global testing, inspection and certification market is segmented on the basis of criteria such as service type, sourcing type, and industry. By type, the market is categorized into testing and inspection and certification. Among these, the testing and inspection segment is presently the most promising in terms of revenue opportunity and is expected to fuel the growth of this market over the forecast period. Based on sourcing type, the market is segmented into in-house sourcing and outsourcing. Furthermore, the key industries that utilize TIC services covered in the report include infrastructure and construction, transformational and contract manufacturing, food and beverages, agriculture and forest, information technologies, chemical, healthcare & pharmaceutical, transportation and logistics, travel and tourism, energy and utilities, water and wastewater management, government, education, textile, and cosmetics. Among these, the infrastructure and construction and energy and utilities are the leading segments and are expected to enhance the growth of the market around the globe. The energy and utilities sector was the largest contributor in the testing, inspection, and certification market in 2015 and is expected to retain its position throughout the forecast period. Emerging nations possess huge potential for the development of the testing, inspection, and certification market. The volume of goods being exported from emerging countries to developed countries has increased drastically in the recent past and trends suggest that there has been an increasing focus among western companies to control the entire value chain. The goods exported must conform to the relevant western standards. Moreover, the expansion of the middle class especially in the BRIC countries has resulted in people becoming more health conscious. People are becoming choosier about the food they consume and often prefer food that is certified. Furthermore, demand for water, energy, and consumer goods is growing with the improvement in the economic situation and a higher disposable income. However presently, the testing, inspection and certification market in Europe is the leading revenue generator, chiefly owing to the presence of stringent regulations and guidelines in various industries such as food and beverages, oil and gas, infrastructure and construction, cosmetics, water and wastewater management, and transportation. European customers are well aware of the benefits associated with testing, inspection and certification services. Some of the leading players in the global testing, inspection, and certification market are Intertek Group PLC, Bureau Veritas SA, SGS Group, ASTM International, ALS Ltd., TUV SUD AG, DNV GL Group AS, AsureQuality Ltd., Underwriters Laboratories Inc, Dekra SE, Lloyd's Register Group Limited, and TÜV Rheinland Group. This report provides an analysis of the global Testing, Inspection and Certification for the period of 2015 to 2025, wherein the period from 2017 to 2025 comprises the forecast period and 2016 is the base year. Data for 2015 is provided as historical information. The report covers all the major trends and technologies playing a major role in the growth of the Testing, Inspection and Certification market over the forecast period. It also highlights various drivers, restraints and opportunities expected to influence the market’s growth during the said period. The study provides a holistic perspective on the market’s growth in terms of revenue in US$ Mn, across different geographical regions namely North America, Europe, Asia Pacific, Middle East & Africa and South America. certification services wherein the major purpose is to help increase the productivity and also help local manufacturers to comply with the global standards. The market overview section of the report showcases the market dynamics and trends such as the drivers, restraints and opportunities that influence the current nature and future status of this market. The report also provides ecosystem analysis and key market indicators for the Testing, Inspection and Certification market. The Testing, Inspection and Certification market data estimates are the result of our in-depth secondary research, primary interviews and in-house expert panel reviews. These market estimates have been analyzed by taking into account the impact of different political, social, economic, technological and legal factors along with the current market dynamics affecting the market growth. The global testing, inspection and certification market is bifurcated by service type, sourcing type and industry. By type, the market is categorized into testing & inspection and certification. Among these, testing & inspection is the major segment which is expected to fuel the growth of this market over the forecast period. Based on sourcing type, the market is segmented into in-house sourcing and outsourcing. Furthermore, the industry segment is categorized into infrastructure & construction, transformational & contract manufacturing, food & beverages, agriculture & forest, information technologies, chemical, healthcare & pharmaceutical, transportation & logistics, travel & tourism, energy & utilities, water & wastewater management, government, education, textile, cosmetics and others. Among these, infrastructure & construction and energy & utilities are the key segment which are expected to enhance the growth of the market around the globe. The energy & utilities sector was the largest contributor in the testing, inspection, and certification market in 2015 and is expected to retain its position throughout the forecast period. The report also includes competitive profiling of the key players associated with the Testing, Inspection and Certification around the globe. The important business strategies adopted by them, their market positioning, financials, SWOT analysis and recent developments have also been identified in the research report. The competitive landscape section of the report also gives an overview about the major contributing regions/countries by these key players in order to strengthen their market position in the future. Some of the major players in global Testing, Inspection and Certification market are Intertek Group PLC, Bureau Veritas SA, SGS Group, ASTM International, ALS Ltd., TUV SUD AG, DNV GL Group AS, AsureQuality Ltd., Underwriters Laboratories Inc, Dekra SE, Lloyd's Register Group Limited, and TÜV Rheinland Group. Details such as financials, business strategies, SWOT analysis, recent developments, and other such strategic information pertaining to these players has been duly provided as part of company profiling.